I am late, I am late, and I apologize mightily, but this past week has been keeping me hopping, and not in all good ways. But finally, I'm posting the first of Madame's commissioned full readings. Enjoy! Madame Destiny is wearing a hat that is adorned with enough brown, black, and white feathers to have once been an entire pheasant, with several extremely long iridescent feathers trailing from it by a good two feet. Her wrap is edged with undyed wild turkey feathers, and her suit is in earth tones as bold as chemistry can make them: bright rust, black speckles, and dark brown skirt and jacket, over a white blouse with a lace jabot. Her bangles and earrings are of tortoiseshell and dark wood. There is a brooch on the hat that is a pheasant head done in rhinestones. The pheasant stares at you unnervingly. "Now, dear," she says, carefully stretching her hands and wrists, "we're going to do a full reading today, correct?" She picks up the deck and shuffles it expertly. "This will be a general sort of reading. Just to give you a feeling for the way the world is treating you and perhaps is going to treat you." She flips the first card, which she lays in the center of the table. The card shows the eight heavily-armored forms of the Guardians as they blast off into a night sky, rockets blazing behind them. Each Guardian is a different color, and the card is reversed to you. "Ah, my dear," Madame says, "as you may guess, this group is the Guardians, shown taking off on their very first war mission to destroy the Sky Fortress Re del Cielo, representing the eight of wands. They were not particularly well-prepared for the mission: they were a privately-funded group that volunteered for the Armed Forces, and so they didn't get the same kind of rigorous training that the Gold Stars and Bulletproof Brigades received. They did accomplish their mission, but they took some terrible losses." She turns the card to be reversed to her for a moment, then spins it back into place. "This is your position right now: you have a lot of energy and it's sort of... going all over the place. You don't have a lot of direction or guidance, and so when you try something, you bog down because you can't figure out how to bring all your resources to bear on the problem." She flips the second card onto the table so it sits above the eight of wands from your perspective. The card depicts a curvy white woman wearing a red sheath dress slit to the hip (exposing a thigh holster), standing in a WWII glamor girl pose at the edge of a stream. Her blonde hair cascades over the left half of her face and her left shoulder, and her left hand is poised delicately on her hip, while her right arm is upraised, and she is firing some type of rocket gun into the air over her head, and the rocket has exploded over her head in a star shape. The card is reversed to you. Madame points at the card. "The crown of the reading -- the theme, if you will -- is the Bombshell, who stands for the Star in this deck. This is the first Bombshell, who was actually something of a mad scientist who rather liked explosions. She invented that rocket gun, as well as many other things that blew up, and masterminded some of the greatest demolitions and daring eleventh hour rescues of the war." Madame smiles at the card fondly. "The Star is a card of hope, the way that if you knew the Bombshell was deployed nearby, there was always hope that a beautiful blonde would save you. Unfortunately, she's reversed in your reading. As you may know if you paid attention in history class, the first Bombshell perished in one of her own explosions -- and that's what you're doing to yourself. You're, ahem, blowing yourself out of the water before you can really get started on anything." Madame places a third card below the eight of wands. It shows a broad, muscular, dark-skinned man wearing flight goggles, a green chain mail bodysuit, and black combat boots. He is grinning manically and holding a metallic staff that's smoking at both ends. The card is upright to you. "I love this card," Madame says. "That, my dear, is the Smoking Snake, pride of the Brazillian para force. He was bulletproof, superstrong, intelligent, witty, and devastatingly charming. Even as an old man, if I may say so, dear," Madame adds, fanning herself. "He went to Italy with the Brazilian Expeditionary Force in 1944, but he'd participated before that -- unofficially -- in a number of actions with the PanAmerican Gold Star Auxiliaries. The Smoking Snake was a great leader, utterly indefatigable. In this deck, he stands for the King of Wands: a force to be reckoned with who knows what to do with his energy. He doesn't stop until he meets his objective or accomplishes his mission. This card is the root of the reading -- the thing that anchors you, for good or ill. And I think in this case, perhaps for the good. Perhaps there is a masculine figure or force in your life who keeps you on your path?" She deals a fourth card to the left of the eight of wands. Two young people stand under a chuppah, holding hands and gazing into each others eyes while a crowd of soldiers and costumed paras cheer behind them. The man looks half-starved, his hair cropped very short, and he is wearing fatigues that hang on him unflatteringly. The woman is wearing an armored Soviet soldier's combat uniform with lightning bolts down the sleeves and trouser legs, and her hair is cut in a short 40s bob. "Oh," Madame says, "this is the wedding of Heat Lightning to her beau Abram Berkowicz. She had been part of the Allied para offensives since nearly the beginning of the war, and at some point, had lost touch with her family and Abram. They had, of course, been taken away to concentration camps, and she spent her free time during the rest of the war searching for them. The story goes that not long after liberation of the camps, she managed to track Abram down, and the two of them insisted on being married immediately. I understand they were married for 56 years before Abram passed away." She dabs at her eyes with a white lace handkerchief. "This card is the four of wands, and is in your recent past: a partnership that has lasted long and well." The fifth card is placed across the eight of wands. It depicts a slender, pale young man in a tailored black suit. He has long black hair tied back in a queue and is holding a walking stick topped with a silver skull. When Madame turns the card to face you, it is reversed to you; she slides it back into place. "This card is the bridge over which you are passing, and our friend Comrade Death is here. You've heard of Comrade Death, haven't you? He's a vampire, you know, one of the embarrassing little problems the vampire community has, turned as he was as a young teenager." Madame pauses thoughtfully, then snaps her fingers. "Mikhail Alexandrov, I knew I'd remember his name if I just thought about it! Anyway, he was one of the stealth operatives who worked in Berlin itself, and they say that his actions were key in bringing down Germany. Little changes here and there that eventually changed greater things. In this deck, he is, as you might expect, Death. And Death isn't a bad thing! It's change. But what you have here is Death reversed: stagnation. This is the bridge you are crossing in order to move forward. You're probably feeling stuck and unable to move, mired, perhaps, in the quicksand of your lack of hope," she adds, pointing to the Bombshell reversed. The sixth card is placed to the right of the eight of wands. It shows a young worried blonde girl in a dark green tailcoat sitting astride a great black horse with glowing red embers for eyes. The horse's right front hoof is hock-deep in a stream of blood while a green hilly landscape and a night sky stretches away behind them. The card is reversed to you. "Believe it or not," Madame says, "that's the Equestrian when she was just starting out. It's the expression that gives her away there -- she actually looks young, which she doesn't any more. She represents Temperance, and reversed, this card is really about leaping without looking, being impatient for things to get things done. Molly became the Equestrian because she was impatient with the War Office and everyone in authority; her mother was ill and her siblings were young, and her father's unit had gone missing, like so many men in the war. She set out to find him herself, and caught the attention of the pooka she rides. They made a hasty deal, and rode off into the war zone together. Most such hasty actions do not work out as well as hers. So instead of leaping into thing after thing, trying to pull your energies together and direct them--" she points back at the eight of wands "--think about your course and what has worked for you in the past, and go about it slowly and patiently." Madame deals the seventh card below and to the right of the central set of six. The card depicts a young white woman in a white nun's habit with a sprawling white cornette on her head. She is facing to the right, raising a large chalice in her hands, and you can just see what appears to be a red crusader cross on the back of her habit. The card is reversed to you. "This is Sister Peacebringer, representing the Knight of Cups. You may or may not know that she is a member of the Mystikai, having been given her abilities by, reportedly, an angel. She says that she brings peace to anyone she touches, and she got a lot of work during the war, as you may imagine, despite being quite a young woman at the time. She was very practical and workmanlike with her self-imposed duties, and made many people's lives a little better as a result of her time on the battlefields. Here, she is reversed, in her mode of not necessarily seeing the down side of her abilities and consequences of her actions. She represents you, the seeker. You have a very good, practical grasp on emotions and relationships, particularly your own. You have the ability to perceive many things in yourself and others, but you have not quite got to the point of being to act reliably on that knowledge and understanding. The Knight is someone with a certain amount of very practical and useful wisdom and knowledge, but who has not attained the mastery of the Queen, and reversed, this is emphasized. You still have to keep working to get to the Queen." The eighth card is placed above Sister Peacebringer. This card depicts five people in various active poses on a rooftop with the Trylon and Perisphere in the background: a muscular man in a billowing black cloak and full-head concealing mask; a rather tall, broad-shouldered woman in a similar costume in charcoal grey; a young man in a black-and-grey swirled bodysuit and fully-concealing mask; a young woman in a midnight blue armored jacket over a black bodysuit ; and a slender teenaged girl in a patchwork cloak of various shades of grey and blue over a black bodysuit and a full-head concealing mask. Each of them wears a pair of gold-and-black discs with stars in them at their belts. Their poses, while active, reveal an interaction and affection between them: the bigger man and woman stand close together, peering over the edge of the roof; the woman's hand rests on the shoulder of the young woman, who is turning toward the young man and the teen, who appear to be in conversation. The card is upright to you. "You might not know them all," Madame says, "but that's what people referred to as the 'Night-stalker family' back during the war. 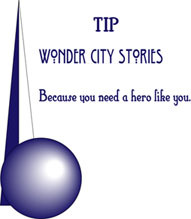 So many heroes were overseas that Nox the Night-stalker added what we later learned really was his family to the team watching Wonder City for crime. The woman next to him was his wife, Nyx. The boy was their son, who used the name Moros at the time, and the older girl was their daughter, who used the name Nemesis; the younger girl was also their daughter, and went by Eris. They worked together extremely well for the entirety of the war, and were the epitome of the solid American para family who stood up for America in their own way. In this deck, they represent the ten of pentacles -- happiness, togetherness, family, fulfillment. This card is the position of emotions: you are well-pleased in those you consider your family. They bring you a sort of wealth in your emotions and craft and spirit." She deals the ninth card above the ten of pentacles. This card shows a raucous party in the foreground, people standing around with glasses raised, and behind them, the centerpiece of the card, is a figure in a dark purple hood and cloak, walking away from the party into the dark and lonely streets. The card is upright to you. "That," Madame says, pointing to the figure, "is the Indigo Hood, a vigilante who turned his back on his wealthy and privileged social life to take to the streets, rousting out the Axis spies that seemed to be just everywhere in the latter years of the war. This depicts his decision to become a hero, you see. And this card is the eight of cups, and is in the position of your hopes and fears. Perhaps you both hope and fear that you will be able to explore your inner self and pursue something greater. You probably feel somewhat... overtaxed right now, and would very much like to be able to do go on a quest of that sort to regenerate and refresh yourself. And you probably fear what you might find in doing it." The tenth card, places above the eight of cups, depicts a golden staff, engraved with flame shapes from base to tip and topped with a disc of clear glass that is quartered by lines of bronze. The base ends in a steel point. It floats against a background that is an antique map of the world. The card is upright to you. Madame raises her eyebrows. "Well, then," she says with a little smile. "This is your outcome: the Staff of Akribeia. It is, supposedly, a magical staff that is able to focus the heat of the sun with great precision upon a single small target. That target may be utterly annihilated or just gently warmed, depending on the exact desires of the user. To even begin using it, one must master the extensive magical tome that accompanies it -- magically, of course -- at all times. By legend, only three or four sorcerers have had the patience to read the entire tome and be able to elicit enough fire to light a pipe, much less raining fire down upon a single house in a city, or any of the other things it supposedly can do. Mastery is difficult, but if you apply yourself, the results can be great. This is your outcome card, the Ace of Wands, and a very positive outcome it is." Madame gestures to encompass all the cards. "I think the message here is extremely clear." She taps the two crossed cards at the center, the eight of wands and the reversed Death card. "You are stymied, stalled, and stuck. You are directionless." She taps the reversed Star at the crown of the reading. "You are without hope that you can drag yourself loose from this morass. The thing to remember is that you cannot pull yourself out of a bog by moving suddenly, leaping and scrambling for solid ground." Her fingertips rest on the reversed Temperance card. "You have excellent supports and background and self-awareness." She touches the King of Wands, the Knight of Cups, and the Ten of Pentacles. "You need to leverage everything that you know helps you -- and you know them, you just don't always use them -- and start carefully paddling at first, and reaching for anything that can pull you to shore, thinking about where you're putting your feet and testing the ground you're about to move onto. If you can move slowly and with consideration on your examination of your inner and outer life," she says, tapping the eight of cups, "then you have a very positive outcome indeed--" her hand rests on the Ace of Wands "--indicating that you will be able to direct your energies wherever you want to go, on whatever you want to do." She folds her hands and smiles. "I hope that helps, dear." OMG WOW. I'm kind of speechless. What a beautiful draw (and I love the descriptions of the cards). I think the four of wands was my favourite. -- ACE OF WANDS, HOT DAMN.